Several years ago, while wandering through the science fiction and fantasy section of the local Media Play, I crouched down to see what was on the bottom shelf in the M section. 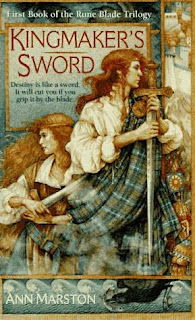 My eyes caught on a book that was faced out and that featured two warriors, one red-headed and one blonde, both of them sporting copious amounts of cloudy hair and swooping kilts, clutching swords in their hands. I'd never heard of Kingmaker's Sword or author Ann Marston before, but I decided to pick it up based on the fact that it was a mass market paperback (and thus inexpensive) and that I liked the colors and the soft, matte finish to the cover. I noted that it was the first in a trilogy--the Rune Blade trilogy--and that the other two books were on the shelf so I could easily come back for them if the first book entertained. Mouse is a slave. Dubbed Foxmouse because of his flaming red hair, he is now known as just Mouse and he is about to make his escape. Two nights ago his sole friend in the world was savagely assaulted and murdered while he watched and that horrific act simultaneously crushed Mouse and did away with any reason he had to stay in the filthy hole he has lived in for as long as he could remember. While on his headlong flight to freedom, Mouse runs into his past in the form of a hulking Tyran clansman on a journey to find his long-lost nephew. Suspecting Mouse may just be that boy, Cullin dav Medroch dubs the boy Kian and takes him under his wing. On their way back to Tyra, Cullin and Kian encounter a determined swordswoman by the name of Kerridwen who is on a quest of her own. When Kerridwen and Kian accidentally cross blades a bond is forged that takes them both unpleasantly by surprise and shapes the direction their paths will take from that point on. I was pleasantly surprised by Kingmaker's Sword. Judging by the kilts on the cover, I should have known to expect a rollicking Celtic-inspired sword-and-sorcery adventure, and that's exactly what it was. Tyra is essentially a slightly altered Scotland, along with the island of Celi and the province of Skai, where Kerri hails from. The book opens with a breakdown of the different seasons in this world, a pronunciation guide, and a map--sort of the holy triumverate of opening pages when it comes to pulpy sword-and-sorcery novels. There is nothing earth-shatteringly new in these books, but they are undeniably fun, smoothly written, and peopled with enjoyably heroic characters pitted against dastardly evil sorcerers against a suitably epic backdrop. I ate them up with a spoon and they have worn rather well over the years. This trilogy follows three generations of Kian's family, including his children and grandchildren. And while I'm usually dismayed when a series jumps generations like that, I have to say that is not the case here as the second novel, The Western King, is definitely the finest installment. Marston follows this trilogy up with another, the Sword in Exile trilogy, which continues the story of the rune blades and the line of the princes of Skai. It, too, is worth a read. Both series are now out of print, but if you can find a copy I do recommend them, particularly for fans of Jennifer Roberson, Susan Dexter, and Moira J. Moore. Great Review! I really like the cover! Argh! She tells me about this really interesting sounding book and then tells me it's out of print! Good review, this one sounds interesting. Maria, there you go. The cover clearly works. I was so bored today but now I have a mission. To find these books. Thanks Angie! I love reviews on older books. Sometimes we get so exicited about all the new shinny books that we forget the older gems that are out there. Li, isn't it the truth? Abe has saved me many a time. I have these books, & can heartily endorse them. They are beautifully written & as you can see, the covers are absolutely gorgeous.